H Cope & Sons portfolio showcasing our services and demolition contracts we have undertaken. 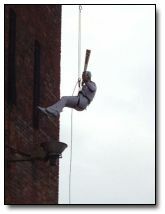 The Olympic torch visit Grimsby Dock Tower and one brave man brings the torch down. Impressive !!! Copes RTUM has been in operation now for 3 years. We have been diligent in how the mortar is produced and take pride in each tub that is produced. We have a view that you are only as good as your last delivery and so deliver the same, high quality product each time . The majority of bricklayers like the product and we strive to give an un-parralled service which our competitors would struggle to achieve. 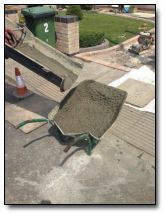 In fact our competitors have been known to sample our mortar because it is so good !! Demolition of Maltkin in Driffield 2006, this collection of Images show the 'High Reach' ability of the Volvo EC360CL part of the H.Cope & Sons Demolition Contractors Fleet. Demolition of the old Police Station in Middlesbrough town centre 2009. Dismantling of PS Lincoln Castle on Alexandra docks Grimsby.